GoldBox is a piece of dual SIM Bluetooth technology, ultrathin and lightweight, which adds one extra phone number to your Apple iPhone, iWatch, iPad and iPod Touch smart devices. The GoldBox adapter converter comes in the form of a credit card sized piece. It connects to your iDevice via Bluetooth to use 2 SIM cards active at the same time on your smartphone and tablet or get more voice calls and sms on your Apple Watch or iPod. The smallest Dual SIM adapter with simultaneous connection. GoldBox is the the thinnest bluetooth dual SIM card adapter which allows you to have both numbers active at the same time on one iPhone. With its credit card sized format, only 4mm, it fits easily in any pocket. SIMore App is available on Apple Store. 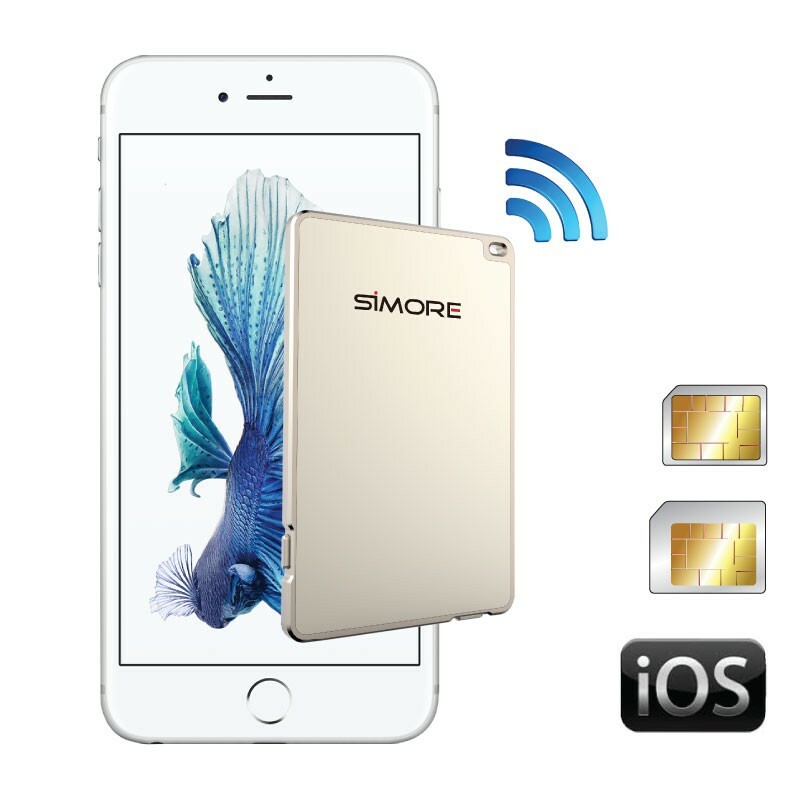 Download and install the SIMore App from the App Store on your iDevice and add cellphone capability to your iPhone, iPad, iPod Touch or iWatch. GoldBox is a dual SIM adapter which allows to use 2 active SIM cards at the same time on your iPhone. This bluetooth dualsim converter transforms your iPhone into a Dual SIM simultaneous smartphone without jailbreak. You can manage your calls and your messages on two active SIM cards from the screen of your iPhone and centralize all data of your SIM (phone book, SMS, call logs ...) on one phone. GoldBox converter turns your iPad Wifi into a mobile phone or your iPad Wi-Fi + Cellular into a Dual SIM cell phone. GoldBox turns your iWatch and iPod Touch into a cell phone to make and receive calls and SMS. Small, light (26 grams) and easy to carry, the Dual SIM device GoldBox always stays with you, all the time, everywhere. The Bluetooth adapter GoldBox is easy to use and is used without jailbreak. GoldBox converter is also a camera remote shutter for your iPhone. The long-lasting battery of the GoldBox dual SIM adapter is rechargeable by micro USB. Credit card sized, GoldBox takes place easily to your pocket, your wallet or a bag. No jailbreak: Just download and install the SIMore App from App Store on your Apple system. What is the battery life of the GoldBox adapter ? The GoldBox dual SIM has its own battery. The battery life is 4 hours of talk time and 100 hours of standby time.